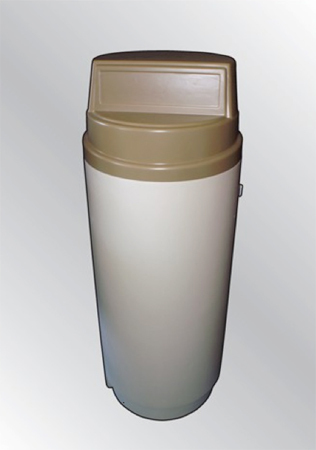 This compact purifier, designed for smaller spaces, will provide excellent quality purified water with very little under sink space used. This unit is designed for 1 to 2 people. $555.00 plus installation. Dual Filter with U.V. Add On” This unit is designed for low T.D.S. water and unchlorinated water. The U.V. 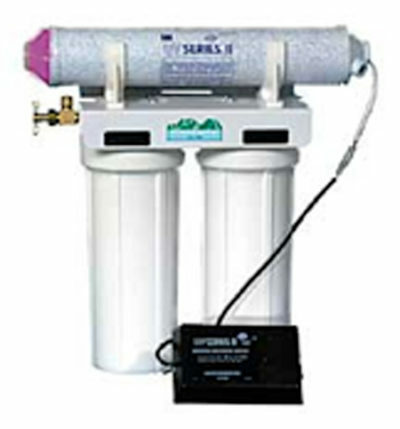 is optional, but recommended for unchlorinated water sources. 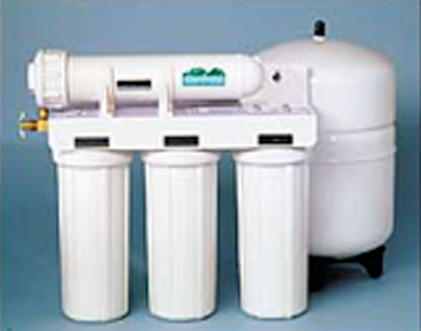 The unit is designed with a 1 micron sediment filter, to remove particulate, 0.5 micron carbon block, to remove chemicals, chlorine, herbicides, pesticides, bad taste and odors. The carbon block will also remove lead by using a “cation resin” and, since the carbon block is sub-micron rated, it will also skim out bacteria. 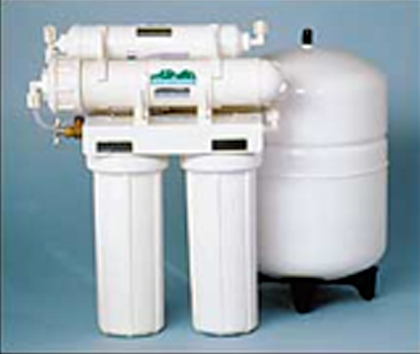 This mainline unit is 1.5 cubic feet of carbon and is designed to remove chemicals, chlorine, herbicides, pesticides, bad taste and odors. 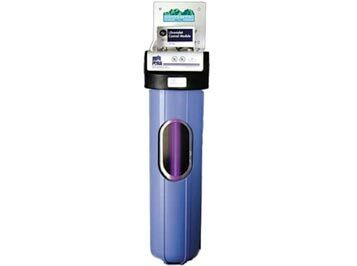 It comes with a Time Clock Fleck valve that will automatically back wash at a pre-set duration. 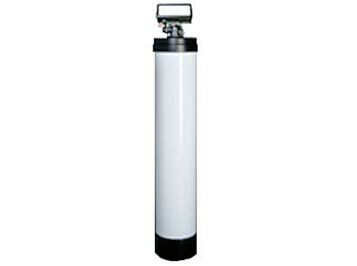 This unit is for unchlorinated water or commercial water post application. Mountain Slope Water carries a variety of Ultra Violet units. 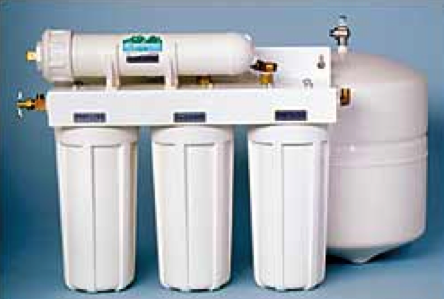 This mainline water softener unit is designed for compact areas. Carbon mixed media options are not available with this unit. Excellent for smaller homes, apartments or townhome, with limited space. This mainline conditioner is designed for a home up to 2,500 square feet. 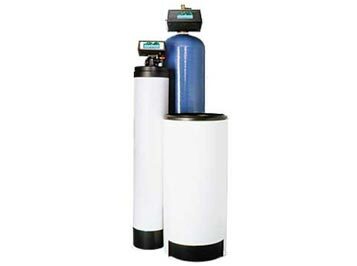 It has ¾ cubic feet of carbon, for chlorine and chemical removal and ¾ cubic feet of water softening resin, for soft water and calcium, magnesium removal. The unit comes with a brine tank that holds 380 pounds of salt. 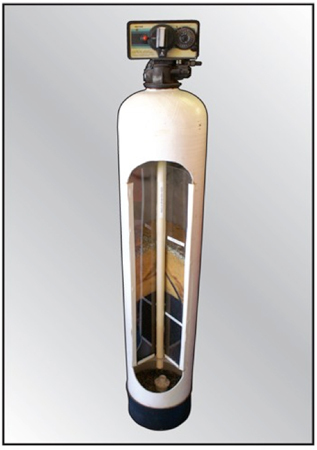 The unit is designed with a Fleck control valve with a ¾” of 1” inlet/outlet porting. These are the two sizes for a mainline media tank. The larger “blue” tank is for a home larger than 2500 square feet. It is a total of 2.5 cubic feet. The smaller media tank is for a home up to 2500 square feet. It is a total of 1.5 cubic feet. The short white tank is the salt brine tank, which holds 380 pounds of salt.